When approaching the new year there will be a moment just about an hour before or just about an hour after the time of the new year wherever you live. This moment will be physically noticeable by many of you. For some of you it will look like a quick flash of light - very fast but noticeable, either out of the corner of your eye or a little more in focus. For others you will get the impression of something that resembles a window. For still others you will see something that is like a overlay in space. Imagine for a moment that you're turning the pages of a book. The book is open and then you slowly turn the page. In this case it won't be like a book but for a moment it will look like your normal line of sight and then it will be almost as if a page was turned and something is superimposed which looks, once the page is turned so to speak, exactly like the space you were looking at but while the page is being turned there will be something else there. It won't be quite discernible. It won't be the least bit frightening. It will just be noticeable that it's something else. Now I know you want to know what that something else is. I will tell you. That something else that you may see before or just after the new year is what is really here. I know that we've all been told this is an illusion that we're living in but there is something else here and I grant that while that may be true what we are living in is our day to day basic physical reality and we must live in it until our time here is over but the something else that is here - the underpinning so to speak, you might say the foundation, is the building blocks of creation. Creator has set this world up for us so that we can learn how to continue it and assemble it - yes and reassemble it and how to support it for ourselves. In recent years we have been crying out for that support in our lives but many sources have been present, guidance and teachers, on how to generate that support for yourself. I have made some attempts in these directions and there certainly have been others. We do not have to give up our religion, we do not have to give up our beliefs but we may have to give up our helplessness. I believe that there is nothing in any way that is truly helpless about us. I grant that at many times we need help from others and others need help from us but that help is available if not always known and understood by individuals. It is a time now to discover what each of us has to offer and discover our true treasure trove here which is each other. Let's consider a universal resolution for this coming year. Perhaps we could say, "I join with my fellow beings of the Earth to welcome all of our unique personalities and to prepare to share those qualities of uniqueness when called upon for any action that will serve the greater good of all beings" or something very much like that if you like. Let's make some gentle efforts at least - towards the discovering of the true gift of our fellow human beings and what their natural talents are. Let's not discard their natural talents if they don't fall into the natural, as we see it, order of our own philosophy. Let's consider that there may be some talents among us that have to do with future circumstances. So if your child or your friend or your uncle or your aunt or your mother or your father seems to have something about their personality that is benevolent - yes, not harmful - certainly but seems to be a quirk - something they can do - something they do that is not harming others but is a definite quirk of their personality - it might just have to do with some task or ability that they may be able to perform when the circumstances present themselves sometime in the future. Let's accept these quirks and consider them to be profiles of future capacities. intelligence and I referred to days gone by in the distant past where someone would be approaching a plant. Now - as you would have approached that plant did you simply go over and pick a bunch of leaves and gobble them down - no, of course not. If you were fortunate you'd have amongst you a medicine woman or man and they would have understood plants better then you, having had knowledge passed on to them but if that was not the case and most times it wasn't the case in ancient times you would have approached the plant as an equal. You would have honored the plant - saying something - perhaps sounds, sounds are always acceptable to plants if they are soothing and you would not have been hunting or stalking the plant. You might have asked the plant in some way using sounds or your own language of the time whether it could spare some of its leaves to nourish you and if you'd had a good feeling the plant would have been acknowledging that it could do that. Then you would - by moving your hand around 3 to 4 inches, up to 6 inches away from the outer perimeter of the plant - you would have moved your hand very slowly starting in any place or a place that felt good - not pointing your finger towards the plant - just moving your hand - palm towards the plant around the plant and at some point you would have felt great warmth in your physical body. This then would have been the area of the plant where you could pick some leaves. Then you would have pointed your finger in that area and moved around from leaf to leaf. Now you might reasonably be asking how many leaves would it take to feel satisfied. There is another point here. In these times, our times, one feels that one is not full if one does not have a certain quantity but in ancient times one would approach a plant like that and the plant would be telling you literally not only what part of itself was the safest for you to eat but what part of itself would have been the best part for you to eat. You would then - moving around that area that felt the best because your physical body reacted to the physical body of the plant which would be speaking to you physically in that language and you would point and you would find 1, perhaps 2 leaves and those you would move closer to and if it had continued to feel good you would have very gently removed them from the plant - not at the same time. First one, then the other. Then you would have thanked the plant, perhaps performing a blessing of whatever was native to your culture at that time and you would have backed slowly away from the plant thanking it for its great gift of a portion of its body to your body but you would not have eaten the leaves in the presence of the plant. This would not be considered polite. You would have moved away and tried to get out of sight of the plant. If there was some cover you would have consumed the leaves back there or divided them up amongst your family and friends and you would have eaten them very slowly. You would have chewed them very slowly all the while giving blessings and thanking the plant and life and perhaps a deity if you had one at that time - but it is the plant you see that is offering of itself - so that was thanked first - and while you were chewing the leaves - the energy, the strength and the vitality of the plants body would have been entering your own. It wasn't to chew it and swallow it. You chewed it many times and you did not swallow it until you felt no more vitalization - no more - it was like a subtle vibration. You did not swallow it until that feeling went away - and when that feeling was no longer present through chewing and swallowing your own liquids in your mouth, then you would have taken on all the vitality and you would have then swallowed the leaf. You'd be surprised how very much energy was derived this way. I will say more about this in times to come. For right now, I do not recommend that you do this unless you have that wisdom in your culture - then speak to the wisdom keepers of your culture in order to understand how you can go about this. Have you ever wondered why there are so very many people on Earth at this time. Is it simply a matter of arithmetic, numbers, equations - no. Long ago when there were fewer people on the Earth, people then had to live a little bit more by their senses. It is believed these days that people live by their wits but you couldn't live by your intelligence - you see you really couldn't do that then because you would often as a person, be moving from place to place according to how long it could sustain your life and the lives of your family or your clan or your tribe. So you would move from place to place and therefore you would always be exposed to new plants, different kinds of animals and if you used your intelligence, "I wonder what this means" it would take to long you see. There would be things that could happen quickly. You would have to be able to use your feelings and that's why I talk about that on this site so much. In these times people have become enamored of using our wits and they've become suspicious of our feelings. So - this is understandable when approached from the position of intelligence alone because intelligence has difficulty in quantifying and reproducing in a predictable fashion that which is sensed and felt since feelings occur for different people at different times though in much the same way. Science has trouble with things like this - and intelligence exclusively also but we are born with all our feelings, we are not born with our knowledge. What does that suggest. Our feelings are our primary means of living. Our feelings tell us when we are hungry, they tell us when we are sleepy - even intelligence does not count that out. Intelligence is not the enemy but it is the student and it has a tendency, speaking about intelligence as if it were someone, it has the tendency to serve its own needs over and beyond the needs of ones physical self and the needs of others. That is why it is possible for people to ignore the needs of others because feelings are being ignored. In days gone by when there were fewer people on the Earth it was not something that you could ever do. You would of course gain a certain amount of knowledge or wits as I'm calling it here but that would never supersede your senses - your feelings. You might for example, approach a plant that had been perfectly safe to eat someplace else in your journeys but as you approach this particular plant it doesn't feel safe. You back away - perhaps I would say, "Goodlife" and move on to another plant until you find one that feels safe. Now you might say - well, that's a big risk just diving in and eating that. Well, you don't eat a large amount of it. In fact you would not eat it at all at first, in those days. You would first get close enough to the plant - slowly - as long as it felt good to your physical body you would get close and if it felt good - meaning safe, you had good physical feeling in your body, you might even touch the plant but most likely in those days one would simply get closer to the plant. Now I want to say this, I am not trying to talk you into doing this in these times but rather I'm suggesting that there is another way of approaching life. There is another way of feeling life. There is another way of connecting to all life. Feelings are the means. In societies on our planet where intelligence is considered supreme and especially in societies where feelings are considered to be untrustworthy and are suppressed in others - meaning others are regulated so they do not feel their feelings - no, I don't think so - so they do not pay attention to their feelings - that is how things get out of balance. Intelligence is a student. Feelings are the teacher. I am feeling that this is something that I'm going to post here as a guest column by this Shaman. He is someone known to me and I feel that his writing style and what he wishes to share is compatible with me and with this blog. If you feel good about it, let me know or if on the other hand you feel it is not appropriate for this site also let me know and I will act on that as best I can. Here it is then for your consideration. Greetings. I will allow myself for the purpose of this post and any future posts I am welcomed to do here to be called Magic. It is of course not my name but I would prefer to keep that quiet for now. You will find that my posts will be about what I would call true magic and some might call serious magic which means there will be no levity, that's true but also there will be issues of great import which I feel this post does speak to as it is intending to help people who might otherwise come into difficulties from their unintentional misuse of something. African Masks. Use Them With Respect. I would like to inform you about a form of magic that is being, for the most part, unintentionally misused in your times. Many people have found it to be very attractive to use African art. I am talking less about quickly reproduced items but I am very specifically speaking about African antiques, especially masks created by people with wisdom and very often with strong feelings. Know that the purpose of this art, very often masks, is to provide protection for the home where it is in residence but you find very often since little is known about this in the western world that people place these masks in the home. That is absolutely the wrong place to put them. For protection they are to be placed at the front door and by the front door I do not mean in the little room or in the room that follows the front door. I mean beyond the front door itself and not tacked on to the door. Ideally in some kind of portico that faces out away from the front door. Never use more than one. Let me explain how it works, for African magic of this type is different than other kinds of magic. The mask reacts to malevolent actions towards whoever is living, they have to be residing in the house not just visiting, the mask acts to deflect and amplify malevolence directed towards the residents of that home and it can cause harm. That's why I'm speaking about this matter today since so much of this is being misused unintentionally I believe. There is something very important to know here and that is, any benevolence that is directed towards residents of the home will cause no reaction by the mask. Granted, the expression of the mask sometimes comes into it but it is most important to know that generally speaking all these masks will react strongly to malevolence directed towards the residents but will not react in any way towards benevolence. That's because the purpose of the masks is to protect and it has no other purpose. Now think for a moment, what if you have these masks in a home? You might think - well, I'll put it on my bedroom door and it will keep my sister or brother or other member of the family from harming me but you see - it has the same effect inside the house. If any member is angry for any reason, even a minor reason, it will tend to deflect and amplify that anger back towards them and for people who have large collections if they are calm most of the time and everyone is calm most of the time around them then this may not cause too much of a problem but for an angry household these masks will react constantly deflecting this energy and amplifying it. Now, there is a means to nullify this affect. It is most helpful, and I strongly recommend it for those of you who have them indoors and especially might be in a stormy but loving relationship - something like that or have friends over who are volatile but mean no harm - like that yah, there is something that can be done that will not be visible from the outside - meaning from the face of the mask but can be done to cause a degree of less interaction with the mask and others. First I recommend you say to the mask, speak to it as someone and say, "I appreciate your efforts to protect me and now I feel it is important for you to sleep. I will perhaps call on your services some other time" or you can say "in the future." Talk to the mask sincerely as a person. Don't just talk and then giggle cause you're not sure that this is alright to say. The mask is very sensitive and it is in many ways - like a person. Remember, it is deflecting feelings. This is very much a person thing to do. After that gently remove the mask, lets say from the wall, and first put on the back of the mask a piece of very soft silk and line the entire back of the mask. It doesn't make any difference what color the silk is but don't use it as a means to draw attention to the mask, like do not use - oh something that would bring people's focus towards it. Therefore I recommend a very dark color would be best. Then behind the silk, and the silk by the way is meant to be pressed up into various areas. Don't jam it into all the crevices, just get it as close to the back of the material of the mask as possible. Then behind that use heavy, what is called tin foil as one might line an oven. Make sure the tin foil does not in any way touch the mask itself, that would be like an insult and harmful to the energy of the mask. Let it only touch the silk. In this way the mask itself is protected and insulated and treated with respect and the foil keeps it, by the way don't tape the foil in any way, yah, find another way to keep it attached to the back temporarily just like the silk - no tape because the tape can act a little bit like a conductor, um-hmm, then you see it will allow the mask to rest. Very little of the energy of the mask will then function indoors but still it would be best to place the mask someplace where people are less likely to be milling about. It is not something for a family room. Certainly not something for a bedroom. So someplace in the house where people may not congregate or be very often, perhaps a museum part of the house, a separate place. Perhaps a cabinet with doors that can close completely, not glass, that won't help but wood, not metal - that will agitate the mask. This is what I recommend. African magic has great power and a lot of unintentional influence in your lives. I feel that it would be best to honor it and appreciate it but use it very carefully. I may speak in the future about how to use it carefully but for right now I felt it was important and urgent to speak to these matters of its misuse. I will speak to you again another time on this site. Now comes the time when we have to face the music - what do I mean by that. We have all had opportunities to notice the feelings of others. We don't always realize we're noticing the feelings but we will see various intense looks in the eyes of others and sometimes we will see looks in their eyes that seem meaningful to us and now and then we even know what they mean. How to learn more about this so we can recognize it - here's what to do. Stand or sit in front of a mirror that is close enough to your face so you can see well. Then close your eyes and bring up within you a remembrance of some event or perhaps a feeling that you currently have and know how or what it means. Then quickly open your eyes, note the expression in your eyes and quickly close your eyes. If you do this for just a moment, just a second or two - no more, the expression won't change to one of interest - you understand. It will reveal the feeling in your body. I recommend this because facing the music now is recognizing our own feelings as demonstrated in our eyes and recognizing the feelings of others demonstrated in their eyes. We've all experienced feelings in exactly the same way - granted not at the same times usually. We have around us very often - even if we don't have people around us we very often have animals, maybe our pets. Especially with dogs this is noticeable - their feelings in their eyes but if you live on or near a farm or near animals that live outdoors then you might see this in the eyes of deer or certainly in the eyes of cows and horses. We often recognize those feelings - sometimes they're easy to interpret and other times they're not so easy and yet since we all have feelings on this planet - human beings, animals, plants - yes we all do - then it might be to our advantage to know what the expression in our eyes means as induced by physical feelings in our body. Practice this now and then when you have the opportunity so you can recognize what an expression in your eyes means according to a physical feeling in your body. It's another way to know and understand what your physical feelings mean. It is a way, granted, to sharpen your compassion for yourself but also it is a way to understand the universal language. On this planet we all have feelings the same way and if we hope to communicate in the universal language that we have here which is feelings then we may make progress towards this end by trying out this homework for ourselves. Facing the music is that - given the complexity of our languages these days and given the new words that are being invented because of technology and other innovation - our languages are not getting any simpler. They are every day getting more complex and if you add in the various slang terms and innuendoes and condensed words such as one finds in text messaging for example, language is getting more and more complex and even codified. So - how to find the universal language. Fortunately we don't have to stray very far to do that for it is in - ourselves. If we can begin to recognize the expressions in our own eyes as related to feelings in our own bodies we might just, in time be able to identify those expressions and what they might mean in the eyes of our fellow human beings and then we don't have to face the music in some terrible way. We can face the music in a benevolent way by knowing what others are trying to say to us even if they don't speak our language. This will be very helpful from one human being to another and may also prove to be very helpful for human being - animal communication. Something we could benefit from greatly, I believe. So give it a try and see if you can learn your own feelings or if you like - face your own music. Some day we will communicate by feeling and when we do that, while we may not get every innuendo, we will as we get better at this pick up more and more feelings and subtleties portrayed in the eyes of others and then language may not be quite so divisive as it is now because we will have the universal language of feeling. Give it a try, see if it can work for you. Goodlife. Have you ever felt - perhaps you were in a hotel room or in somebody's guest house - have you ever felt an energy or a discomfort that seemed to be seeping in from one part of the room. As I say, if you're in a hotel it might be multiple storied. Perhaps there are people upset above you and the energy seeps in from above or perhaps beyond the windows in the town there has been some upset or tension. I'm going to recommend another way of deflecting that. If you wear glasses, take them off. If you don't need glasses or any vision aid then simply stare at the wall or ceiling or windows that seem to be the problem area. If it is windows though, I strongly recommend you close the drapes. You don't want to take it in more, a little insulation would be helpful. Stare at it and notice if you see anything other then the drapes. You let your vision soften a bit you see. For those of you who wear glasses this will be easier - with the glasses off of course. If you notice some blurry or light spots, this with your glasses off and so on, this can be alright. It might be a benevolent energy. If you're not sure or you don't notice anything different then try this Living Prayer. You might say, "I am asking that all those benevolent light beings that are available to me now, my guides and other teachers who can be with me now - please come and allow your energy to be all around and about me and be present in front of my eyes as well." Then if you have felt a discomfort looking at the ceiling for example - look at the ceiling. Stare at it and notice if you see light patterns. If you see them out of the corner of your eye and look in that direction and don't see them any more then that tells you that it would be best to not look at them. Let them be present and let the gift of their presence be noticeable only out of the corner of your eye. After you have done that, with the area that you feel in the room is where the discomfort is coming, and by after that I mean after you've stared at that area for a minimum of 5 minutes and a maximum of 20 minutes then relax and see if you can get a nap or go to sleep. There is a better chance of waking up fully rested and having had pleasant dreams after doing this. Give it a try and see how you feel about it. Goodlife to you all and goodnight. Now, let us continue from last time. Here's something you can do for other people, for animals, for the planet herself and even - for those of you who live in cities - for buildings which often take on the tension of human beings and other life forms. Wait until you can get outside to do this. Sit someplace that is having as little metal as possible - perhaps a wooden chair or some other place - you can sit on a rock if you like or on the ground if you wish but I prefer that you don't sit on the ground because you might find that you are transforming too much - meaning you cannot transform, sitting on the ground, the tensions of the whole planet yourself at this time. So sit or stand someplace and first say, "I am asking that I be insulated and protected from harm now in the safest and most benevolent way for me." Wait a few moments - you may feel some energy. Wait a few moments after that. If you don't feel energy or you're not sure then wait about 2 or 3 minutes. Try not to talk or engage in conversation with anyone else while you're waiting. Try not to think too much. Then after that say out loud or whisper or think to yourself, "I am now releasing this tension around me" and what you say is the next part, "I am releasing the tension from the environment around me." Then just exhale slowly blowing gently towards the sun in the sky as I taught you last time and you might have to do this for three or four breaths before you feel a sense of relaxation in your own physical body. Now there is another part you can do for those of you who wish to do so but it requires the ability to visualize a bit and that is this - you can if you like visualize being beyond the atmosphere of Earth and look back and see Earth. You have seen pictures or photographs very often, taken from space of the Earth in the distance. You can imagine that picture if you like or you can just see what you see looking back at Earth. Then look towards the sun in the sky in this vision and first say, "I am asking to be insulated and protected from harm in the safest and most benevolent way for me." Remember when you say these Living Prayers to always say them out loud or at least whisper them if you possibly can. Then wait a moment and say, "I am now going to release the tension from the Earth." Then blow several times - just breathing in naturally and blowing out the breath you have in your physical body towards the sun. Just blow out your breath as you might blow it naturally, not trying to get every last bit of air out of your lungs. Continue to do this for no more than 8 breaths - less if you like - and you might feel a slight lessening of tension in your body. Remember this is not your body's own tension but rather a means your body has to tell you that you have released some of the tension from the planet. If you wish you can do this once a month at any time of day or night you wish, since it is a visualization, and do this for no more than three months. It will help to release the tension of the Earth - the tension that the animals have been trying to tell us that they're being overwhelmed by and the tension of your fellow human beings and even buildings on the Earth. These methods to release tension that can often build and explode out of human beings or be demonstrated by animals in ways that are not natural or native to these human beings or animals is something that has always been intended that we be able to release. If some of you feel that this is something you'd like to participate in more often then once a month for three months then this is what I recommend you do - and only if you wish to participate this way. Wait one month - meaning skip a month after you have done that for those three months and then you can do it for two months - once, you understand, a month for two months. Then wait one month and you can do it on an alternating month - meaning after that. Then wait 3 months and you can start the process again if you like. I'm not asking you to do this, I am simply saying if you wish to do this you can. The reason we do not do it constantly month after month is that there is a very slight chance that you might unintentionally take on some of this tension yourself you see, and that would never do. It is not your job to save the whole planet all by yourself. It is only that you have the opportunity to do as much as you can in the most benevolent way for yourself and others. It is my intention here, as I've said before on Mystical Man, to give you ways to help yourself, to help others - your friends, your family and for those of you who wish to participate - for many others on the planet. It is also my intention to give you advanced work such as this and I will continue in this vein as long as I am able. Remember - you can help yourself, you can help others and you can relieve the tension and the discomfort on the planet and thus practice your own capacities to release and balance. Have you ever noticed on waking up from a dream, a vision of violence from that dream - or even when going about your life a sudden vision of violence. Sometimes it might even show up in the form of what reminds you of a cartoon. I want you to know that there is some process going on here. It is not just something that is being done to you. Rather it is a specific process that your spirit wishes you to participate in, as I've been taught. All over the world now we are conscious of how much violence there is from one human being to another and sometimes even involving animals. We are even shocked sometimes when we hear the things that animals have done and from my experience and interaction with animal spirits as well as animals themselves I can tell that it is not something that they feel comfortable participating in and yet, they are participating to a degree because they feel overwhelmed by the tension in the world. Sometimes, granted, emanated by human beings but other times literally being released by the Earth. We have all, before we come here to Earth, have had at least one life where we have mastered some principle of spiritual experience - meaning a life of spiritual mastery - not necessarily about all things but about at least one thing - this is what I've been taught and this is what I believe. There is a reason for this. You know that this planet and our society can be a great challenge to live in. Sometimes it is not so present in our lives and other times it is more present. This preparation to have a life here has been so that when we are exposed to such tensions or challenges that we have more than what has been provided for us in this life to fall back on as a soul. This is what often allows us to get through such situations and appreciate how we have made it through because of such loving preparations before this life. Now, to get back to what I want to begin here. You have the means and the capacities, just like the animals I referred to, to help that tension release but while the animals have been trying to get our attention that this tension exists we can now say to them or think - thank you for behaving in these unexpected ways towards human beings, you have gotten my attention and now I will act. What I'm going to recommend that you do here is to release tension from yourself and next time I will give you suggestions on how to release tension from the land and possibly even from those on the land near you but for today I want to say this. If you have such a dream or if you have a moment of some kind of vision of violence that may not even be something that looks like human beings - as I say it might have cartoon like qualities - then this will always tell you that this is not something associated with your life but is essentially a means to allow your physical body to, in that moment, feel that tension. This is not done to cause you harm but to alert you to something you can do. First, this is what I recommend you say in the form of a Living Prayer. You might say, "I am asking now to be insulated and protected from harm in the safest, most loving and benevolent way for me." Then you wait. Many of you will feel a sense of benevolent energy present with you. Wait for a few moments for it to settle in. If you do not feel such energies or you're not sure, then wait about 2 or 3 minutes, then you can proceed if you wish. After that time if you're still feeling the tension in your body or there is the memory of it, this is what you can do and you can say this out loud if you wish but if there are others around and you do not wish to say it you can either whisper it softly or you can think it. Say this, "I am now releasing the tension within myself or in my proximity that I feel" but while you are saying this - picture the sun in the sky wherever you are. You might be indoors you see, you might have woken up from a dream - as I say, you might simply be on and about your business somewhere. If you're operating heavy machinery or driving or something that involves mechanisms then wait to do it later but if you can - pause a moment. Picture the sun in the sky and simply, after making that statement that I just mentioned, blow very gently towards the sun in the sky. Now, you will most likely feel the tension in your body ease. The sun you see, has transformative capabilities. We know this scientifically simply because of the suns effect on the Earth but the sun itself cannot take on harm because it is always radiating light and heat and energy. Still, simply by blowing towards it in the sky - before that energy goes very far it will be transformed into something more benign - often completely benign. Now, this is what to do next. If you have the opportunity and if you haven't been able to do it then the next time - because perhaps you were sleeping or something and you're in the bed or perhaps you were driving or operating machinery - next time you're outdoors in the sun - meaning outdoors in the day even if it is a cloudy day, glance towards the sky - don't look directly at the sun but glance in the general direction of where the sun is - just a quick glance - if you have dark glasses on then it's safer but just a quick glance because you are engaging the idea of the sun as well as the physical presence of the sun on your body and if you can - stop. Perhaps sit on a park bench or stand someplace comfortably and blow your breath towards the sky. Try to blow it in such a way as it is not being blown in the direction of buildings, people or anything like that - even trees. Just blow towards the sky. You will find that you may be able to direct your breath towards the sky without tilting your head back too far. If you can do this you will feel, after a little while, a very gentle but perceptible release of tension in your own body. This is something that can help you to release tension in your own body in general though and I will say more about that next time but after you release that tension - then relax. When you blow, try to blow gently - alright. You don't have to release a big puff of air. Now I will continue this next time for those of you who wish to do more besides releasing your own tension. Greetings, this is just a little note to tell you that I have my new Christmas story up. I've been writing a Christmas story every year for the past few years and I've been posting it on another blog I have called Nice Little Stories. This year instead of writing it only on my own I've asked Eileen Meyer to help me, so you'll notice that she also has the byline. It's called The Special Stocking and I hope you enjoy it. Today I'd like to tell you a little story about something that happened sometime ago in my life. My friend was visiting from out of town and we were up in Flagstaff, when I was living in Arizona. I wanted to show him a different way that you could drive in to Sedona where he wanted to visit. So, we started going down the interstate and I pulled off on a dirt road that goes through a small community but then is strictly in the country. However I hadn't gone more then - maybe fifty feet down that dirt road when I had a bad feeling. Now how many times have I spoken to you on this site or on my other about feelings. So many times - yes? So after this many years I'm used to paying attention to those feelings. I backed up a ways and pulled over to the side of the road and I told my friend, "Could you just wait a moment" and he said, "Yes." I got out of the car and I put into application something I had learned which you can learn how to do as well - and this is what I did. I walked away from the car to a spot on the land - none of this was paved. I walked around that general area until I had the best physical feeling in my body and I knew that this was the point to begin. I just stood as if I were - imagine being inside a compass - you've seen a compass before. It has often, a floating needle in order to keep it steady and secure - and also picture a clock superimposed over the compass. As if I were pointing at 12 o'clock I moved slowly pointing my right arm forward with my hand in the wand position and my palm pointed downward. I moved as if I was moving around a clock. Picture yourself as the minute hand on a clock - only moving counterclockwise I moved from one hour to the next very slowly and when doing that I observed in my physical body what direction I was pointing in when I had the most warmth. I couldn't help but notice that when I pointed down the road, in the direction I was driving in the car, I felt bad. I had that bad feeling again and yet there were several other directions I pointed in where I felt warm - I had the good feeling. So I said to my friend that I was sorry that I wouldn't be able to take him down the road in that beautiful back way to Sedona and we drove down the interstate, which was the long way around, to get to Sedona but that's one of the places where I had the good feeling. Sometime after we arrived in Sedona I found out that there had been a incident and the police were searching from near Flagstaff to near Sedona in a wide area for someone who had escaped from prison. This person was a man of expertise in living off the land and in acquiring what was needed in the back country to survive and the chase had centered around the exact area that we would have driven through. We, if we had pursued that drive down that country lane, would most likely have been turned around by the police roadblock about half way into the drive which would have meant about another hour to come back up to where we started and proceed from there. So - I bring this to your attention because this is something you can do. If you ever have a feeling - perhaps you're driving and you go to turn down a road and there may be more than one way to get to the place you're going to. If you get a bad feeling, then if you have time and you feel safe - and perhaps you have a friend with you - then get out of the car and do that same thing. Turn around slowly counterclockwise pointing your right arm out straight in front of you with your palm facing towards the ground in the wand position. Point your left arm straight down towards the ground with your left palm facing towards your body so as to be able to experience Earth energy, and notice when you are turning how your physical body feels. If you get a bad feeling in various directions, see if you can find another way to get where you're going. Notice where you get the good feeling in your body, that might help you to find your way. I have been talking for several installments now on Mystical Man about instinct. I'm going to change the topic pretty soon but I feel that it is important to give you these ideas and suggestions because our physical instinct is something we are born with - which means that Creator feels this is something we must have to live here on Earth. In my experience, it doesn't take too much training to learn more or relearn something we were born with that we may have forgotten - or that we have not received instruction to learn how to use. I hope this has been helpful and as always I wish you - goodlife. Last time I spoke about Feeling Spaces. This time I want to suggest that you do the exact same homework except I want you to feel the space from your solar plexus. In that sense - run a extension of yourself - meaning feel, not with your solar plexus but run something out from your solar plexus. Here's what I mean by that. Sit down for a moment and look at the ceiling wherever you live and relax, put your hands at you sides and while you are looking see if you can feel anyplace on the ceiling with your solar plexus. This amounts to reaching out from your solar plexus to touch something - you see. Now you're not going to be able to make the same kind of physical contact that you would - say touching something with your hand or foot but you might after you try this a few times feel some kind of sensation - okay. Next you do the homework you did last time. Run that extension out from your solar plexus and notice the direction that you're walking in - does it feel good - then walk a little bit that way. If at any moment it feels uncomfortable, stop and turn slowly - I recommend turning to your left in a counterclockwise fashion until you feel a direction that feels good - then move in that direction. Now you can see that this is homework designed to help you to become aware of your surroundings on a feeling level. It's very easy - and many of us have been conditioned - to talk ourselves out of our feelings. Very often feelings are referred to as emotions but emotion is a mental word that describes something vague and not particularly palpable. On the other hand feeling, meaning a physical feeling, is crystal clear to us all. We have all touched things and we have all had physical feelings in our bodies. So it is up to us these days to learn how to use our feelings so that we can move or travel, you understand, in the best direction for us wherever we may be going and arrive by whatever route we take in the safest possible way. The purpose of Mystical Man is to teach you how to get wherever you're going in the safest possible way. It may not always be about physical travel but ultimately it is about travel whether that travel be growth of the mind, body or spirit or whether it be about feelings or instinct - this is all part of your training. Sometimes when we are in the world we see things that are there yes but other times we cannot see no matter how good our vision is because we need to feel. Sometimes we can feel things that are there that cannot be seen. Today I'm going to talk to you a little bit about that. You all know what it's like to get a bad feeling about something. Sometimes you think - it's a thought, something I was thinking about but other times you're quite well aware that it's the environment you're in or perhaps it is some danger in the area. Feeling Spaces is about knowing where to go - when. Here's some homework. I'd like you to find a place - anyplace - it can be out on the land, it can be in your own home, it can be anyplace you like. Keep your eyes open, it's not a close your eyes thing but feel the space in front of you. Don't if you would - reach out with your palm forward. 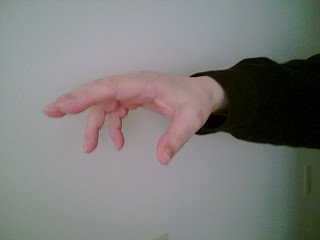 Reach out with your left arm and the back of your hand forward and touch the space. Now what are you doing. You're not actually making physical contact that you can feel - what you're doing is checking to see how you feel in your body. If you feel calm and comfortable walk ahead but as you're walking you don't have to hold your arm out in front of you. Walk ahead a step or two, then stop, then feel the space in front of you. What you're doing is - your body is reacting to the energy in the space that is in front of you. As I say you can practice this out on the land somewhere, you can practice it in your own apartment or house but when you do, turn in different directions and if at any moment you get an uncomfortable feeling in your body then withdraw your arm and retreat until you find a space you can walk towards that feels comfortable or neutral. I'm just introducing you to this subject today because it builds on other work I have exposed you to. I'd like you to get used to doing this with your arm at first because after a while you won't have to put your arm out. There's another way and we'll talk about that next time. Imagine a deer in the forest. The forest is dense but it is possible to move through it. There are leaves on the ground - it is towards the time of Fall. The deer is within your view - perhaps 50 yards away. It is quietly eating. You have not moved nor are you actually physically present - you are only there in your imagination. Suddenly for no apparent reason, the deer runs away. What happened? This is a instinctual reaction. It is my intention to help you to become safe in a world which is often not safe - how to do that. I've been building on this training for some time. Today I want to support your training by providing a little more. Now I'd like you to imagine being that deer in the forest. It doesn't have to be any particular deer that you've seen or known or that you have been near. Just any deer you can imagine being. Feel your legs on the ground. Feel your deer body. Notice the heightened state of alertness you have. You can eat, you can chew, you can be amongst other deer but always there is a feeling around the outside of your body of an awareness. Not exactly a prickly sensation but an awareness. Suddenly you have the urgent need to move quickly in a specific direction - now here's where human beings and animals differ. A human being might think about it, might rationalize why but you as the deer immediately move off quickly in the direction that physically feels the best. This is something I'd like you to try as a meditation or as a visualization because it's important to recognize the physical feelings in your body that occur when you feel the need to move off in some other direction. I know sometimes you won't be able to do it and you'll just have to move through whatever it is that is frightening your body but if you know what the feeling is then you will be able to prepare yourself in some way or be more alert. This is the training I offer you today. Suppose you cannot move away rapidly like the deer from something that feels dangerous, then I recommend you do this. First, quickly say to yourself the following Living Prayer, "I am asking to be insulated and protected from harm now in the safest and most benevolent way for me." After you say that to yourself - try to say it out loud - you can whisper it but if you cannot say anything out loud or even whisper then think it to yourself. After you do that then request that as much gold light and benevolent energy be with you as you can comfortably assimilate. You may feel a shift. Some of you might feel a sense of being physically bigger. This is a good feeling because it creates an actual stimulation of a signal to others that whatever or whoever is approaching is big and/or potentially frightening. It doesn't necessarily scare people because human beings, as I say, might rationalize - well what might it be - and wait and see but it could very easily create a field effect that generates a reaction in human beings or possibly even animals and for those that pay attention to their reactions they might move off and you might be safer. This is something that I feel is important training for you all in the world in which we live. It cannot be used as some kind of an offensive system - meaning like a weapon because there are checks that I've managed to put into place to keep that from happening. However it can be used to increase a safety zone around you when moving through a situation that may be dangerous or may be nerve racking in some way. Remember this is not something you can do very easily when operating machinery, nor do I recommend it for planes in flight and so on - as some instruments might be delicate. Generally speaking it is safe to do if you are say, ten or fifteen feet away from such instruments or more but if you are operating the plane yourself then you may wish to consider some other means of generating safety. This is what I recommend for you in your homework today. For those of you who may be interested I have also compiled a book called Techniques for Generating Safety which you can obtain at Amazon.com. Goodlife to you all. I will say more about these things in the world of instinct as time goes on. Have you ever had an experience with your cat or dog or even a cat or dog that you may know or are passing by - will they ever come up and very delicately touch you - sometimes with their nose, more often with their tail or some other part of their body - it is very delicate and it is not meant to be a more aggressive encounter. There is something special going on here. Sometimes a animal that is a pet or even one that you are around a great deal will perform such a touch. There is even the occurrence for those of you who are sensitive to it that this can even be a spirit animal - perhaps one that you have known or one that simply has a sense of affection for you may also make such a touch. It will be very light but it will definitely be physical. What are these things about? Animals including animal spirits have an awareness of how very influential they are in our lives. We often need help - I do, you do, we all do - and sometimes help from another human being, no matter how much we appreciate that, is not enough. Sometimes we say to the sky, the walls, our world or God, "Help, I need help" and sometimes it comes in this form. Oh yes - it is wonderful to have a dog or a cat or other pet to be affectionate with, to have them be affectionate and loyal with you - oh yes. That can be very wonderful but I'm referring to these very special occasions when they touch you very lightly. Very often what that means is that point of contact on your body would be good for you to touch. Take note of the next time it happens but only when they touch you very lightly and then back off or go on about their life. Touch yourself in that same spot if you can. Perhaps it is a very small spot and a single finger will work - or two fingers but if it is a large spot then use your hand. I would recommend using your right hand but if you can't reach then try using your left hand. Of course sometimes you won't be able to reach, so you will just have to wait for them to touch you again - but try putting your hand or finger on that spot and just see what happens. Sometimes it can be very calming, other times even more so - genuinely relaxing and even other times some feeling of discomfort you have might lessen to a degree or more. This is another wonderful thing that animals, especially our pets, do for us and I wanted to share it with you. Do you know that there are some animals on this planet that are able to teach by more than example. They are able to provide sounds that are meaningful to us. We as human beings get used to the idea that there are other beings on the planet - we have all gotten used to that. We see the animals that we know and love and we also see other animals that we just have to get accustomed to whether we like them or not - and of course there are the birds and the fish and all others that we live amongst. I have said here for some time and in print as well that the animals are not here to learn anything - this is what I've been taught and this is what I believe after years of experience. They are here to teach - yes by example but there is more. Some animals can actually make sounds that are not for them. This sound is provided by a being - you understand a type of being - that is very popular on Earth and that is the cat. The house cat, as we call them, make this sound to us. It is largely misinterpreted as being meow but in fact there is no m. If you listen to it when a cat says this to you, this is an actual suggestion that the cat is giving. It is not simply because they cannot make the m sound - there is no m sound. Do you know - they do not make this sound to each other. For those of you who have lived around cats and have noticed them interacting with each other - they do not make this sound to each other. They might glance up, look at a human being and make that sound. Now why are they giving us that message. Those who live around cats know that cats will often take on energies, especially for a beloved human being that they live with, that can only be described as some suffering or aspect of disease or discomfort that the human being is either going through or could go through with some harm to the human being. To a degree the cat can transform that energy into something more comfortable but there is also the fact that sometimes they will take on something and it will cause the cat to get ill. This is not always the case, of course, why cats get ill but it is sometimes the case - and I might add that dogs and other creatures that live with us do this as well. Cats however, are able to give this message. Some of you have actually had the experience where a cat will stop and stare right at you and make this sound. Of course, many times it's like talking to a young child isn't it - that's our reaction - we don't know what that means. "What is it dear. Are you hungry? Do you need to go out?" In short, we go through the guessing game - what does it mean - and while it might be simply that the cat would also like something to eat and would also like to go out that's fine but it's not that exclusively. There's more to it than that. Eeeeeeeeeyaaaoooooo is a sound that is meant for us to make out loud and it will reduce our level of stress in our physical world. It can actually be used before a stressful situation if you know one is coming up. If you say the sound out loud about 4 or 5 times or more if it feels comfortable or reassuring then it will help to head off a degree of the impact of the stress upon you. Sometimes you can be doing other things and say the sound and it will be calming. I'm not sure if it could be used safely when driving a car or operating machinery but I feel it can be used in the middle of the day - say on a coffee break. You can say it quietly but my feeling is that it is important to say it out loud in some way even if it is almost a whisper. The physical sound seems to help. I have tried it and it does work. So - I'm not saying it's a cure-all but I am saying that when we begin to make the sound ourselves and use it in our lives and memorize it for ourselves - I think you'll find that most cats do not say, "eeeeeeeeeyaaaoooooo" to you anymore unless they feel that you have forgotten to say the sound, you're in a stressful situation and if you just say the sound now - you'll feel better. Now, don't take this as a reason to not to check to see if the cat needs to go outside or needs something to eat. It's just something I felt I'd pass on to you at this time because it's a beautiful example of how animals teach. Some of you may have noticed this comment and my answer in the comments section of More On Instinctual Training, Part 2. I was unable to make actual links in the comment section so I thought I would reproduce it here and perhaps you will be able to actually use the links which are in order if you care to study more about long touch and long vision which are actually posts that are background material for the instinctual training. I came across your blog for the first time today, and am drawn to share with you a 'game' I sometimes play. In order to sharpen my intuition, I will throw my awareness around a blind corner I'm approaching to detect if anyone is there. Needless to say, I'm walking when I do this, not driving! Usually it comes to mind to do this when I'm in a hurry and don't want to run into someone. I seem to have a high level of 'success'. Greetings Anonymous Writer. Thank you for your comment. It does allow me to add some correlation. I appreciate you speaking of your experience. I do have some experience that is similar. One of them comes under the loose application of a form of long touch and here are some titles of posts where you can find material of interest along the lines of long touch and long vision as well. And also it is simply possible to expand our contact awareness - so I know what you're talking about. As you probably know, it is important to not be too open when you do this given that if you feel something uncomfortable it is best to pull back and as is the purpose, that I gather of your remote extension, if you'd felt that you would perhaps take a different route. I began this talk last time on Benevolent Magic . Today I want to talk a little something about instinct and your instinctual body. I have spoken about these matters before but I will speak again. Your instinctual body is made up of your physical self, your feeling self and your spiritual self. It is not really a portion of your mind though you will use your mind to understand it and that's why I'm writing about it. For now I would like to say that homework is useful. Here's some homework. Utilizing what you've built on before, now I'm going to recommend that you try something very gentle as a refresher course. Stand in a room where you are familiar with the surroundings. Ideally, it is to be a room without furniture or at least with as little as possible but if you cannot change the way the room is then move very slowly when you are doing the work - and by very slowly I mean just barely. Close your eyes and ask yourself first, "Am I ready to do this?" If you feel, not just think, if you feel a sense of - yes - then with your eyes closed move - if you like - in any direction. As practice be aware of what is in front of you, and by the way make sure there's no one else in the room. It's alright if there is the beloved pet in the room but not one that might get underfoot. It is best to do it without another human being in the room. Move very slowly forward, perhaps there's a chair there in your way or a table. You will know with your eyes closed just about how far you will go before you touch it. Move very slowly because you will probably contact that piece of furniture soon. Then what you do once you contact it with your legs or body, then open your eyes, turn to your left and go back to the center of the room or where you started. Turn around a few times. You may or may not realize where you are. Again, move very slowly - if you feel a sensation that something is in front of you - stop - this is with your eyes closed you understand - don't proceed any further - it might be a wall or a chair or a table or something else. If you feel the sensation fading, then wait and move forward again very slowly - make sure this is a room without any hazards - alright. If you feel that sensation again, stop and wait. If the sensation does not go away or only slightly lessens - open your eyes and see where you are. You can do this practice for a time. I will say more about the instinctual body as time goes on. This is a refresher course and I want you to become aware that I will speak on this kind of thing much more in the future especially as it correlates to our relations with animals and what we can learn from them. We all are human beings and we have a great deal in common with the animals. The animals know all about instincts - we are made up of the same stuff they are. The reason they do not have difficulties - like we do - with their lives is that they are not here to learn anything. We are here to learn but they are here to teach. It will be my intention to incorporate the animal capabilities in the most benevolent way in our instinctual training in the future. More on that soon. Now let us continue from last time. Last time we stood off at a distance yes - and felt the tree without touching it. Today we will do more. This time I would like you to approach the tree - don't touch it just yet - just approach it but get within a capacity to touch it - meaning just be - say a foot or two away or be able to approach it and touch it. Try to do this at a time when other human beings are not touching the tree - that's really important. So if you need to bring a friend who will ask other human beings to keep from touching the tree while you are there, explaining that you are involved in a spiritual growth function or some other polite reason, that would be best. Now, if you do have a friend there though it would be best that they be a little distance away - ten feet would be good at least and not in your line of sight. Now this is what to do - when you are standing near the tree move your shoulders a bit, alright, move them around. And by the way for those of you who may not be able to stand - might be in a wheelchair for example, that's perfectly alright. You don't have to stand to do this but if you can, move your shoulders around. Then the arm that you use to touch things, alright, be it your right or left - move that arm around especially near the shoulder. After that flex your arm at the elbow. Then after that move your hand back and forth and around flexing it at the wrist. This is all to bring your attention within your physical body. Again as I said last time I don't want you to go out of your physical body - you must stay in contact with your physical body to do this. Then this is what to do - when you feel a distinct sense of being in your physical body - meaning you're moving your hand around, you're moving your arm around - then you can relax that motion. Reach out and touch the trunk of the tree. This is what you do - extend your sense of touch - don't go out of your body just extend your sense of touch so that the tree becomes as if a portion of your own body. By allowing the tree to be an extension of your own body this is a much greater intimacy between you and this other form of life. Some of you will have a pronounced feeling of a change of density as your sense of awareness of your own physical body down through your arm and into your hand and thence into the tree takes place. Make sure if it is comfortable that you keep your hand, or fingertips if that's more comfortable, on the tree. Then allow your feelings to move throughout the tree - don't push your feelings you understand - your physical feelings - don't push it anywhere. It may not go much farther than where you're touching the tree but for some of you it might go down into roots. For others it might go up into the tree - into branches or leaves or needles. Just let what happens happen. Don't at that point try to get a message - don't ask for a message and simply be as receptive as possible. If it doesn't feel comfortable to do this with the tree then break contact immediately. Step back - say, "Goodlife" and go on to another tree but since you will possibly have been working with this tree - for those of you who could approach a tree - then it is alright. The tree will have some familiarity with you but for those of you who were at a distance and could not get closer to the tree, as mentioned last time, then you will have to go to a different tree that you can approach. After you have completed this and hold your hand on the tree for as long as you like, up to two or three minutes is fine, then break contact with the tree - pull your hand back you understand - and only put one hand on the tree - not both - pull your hand back and wait a moment. Don't step back immediately - wait a moment and then see if you get a picture, an image, a word, any inspiration. If you don't, don't worry about it. You have already had a spiritual experience by extending into another form of life that is safe for you to touch. Some of you might have an experience later in a dream but for this moment after breaking contact with the tree, move back slowly. After you get about six to eight feet away from the tree - face the tree and say, "Goodlife" and "Thank you." This training may allow some of you to receive some wisdom or a vision from the tree. If the wisdom or the vision is uncomfortable you do not have to take it on - simply let it go. Don't be concerned that you will be leaving some portion of yourself in the tree, that will migrate out of the tree shortly after you break contact - that's why you stand near the tree for a moment - because there is more going on here than may meet the eye. For you see - when you touch the tree and move into the tree - extending, you understand, yourself into the tree - the tree also moves into you. That's why you can feel the change of density because it's an exchange. So not only will you be receiving the portions of you you extended into the tree when you stepped back from it that short distance but the tree will also retrieve the portions of its being that it has extended into you. This is a technique we will use many times in the future for some of you do have the capacity and if you've been reading Benevolent Magic blog and Mystical Man blog you may have had some of this training already either in the comments area or in the posts themselves. Regardless, it is something you can do to contact other forms of life and perhaps receive messages from them. One word of advice here which is absolutely critical - never do this with a human being - there's a reason. The reason is that it could confuse your own body as to what is you and what is the other person. Of course you often contact other people physically but you do not make an effort to extend into their bodies in this way. This kind of thing is possible but only in the closest possible relationships - it's not something you do to get closer in a relationship but it is something that can be done in the closest possible relationships. I may say something about that here someday but it is unlikely for now - that training is very advanced indeed and requires significant safeguards which I have already put into place for some of you who may accidentally do this. Now, if you get a message or a vision remember that it is to be considered something that is from the tree. It may not be specifically for you, it might simply be for human beings at large. If however - it feels personal then it is worth thinking about or considering and checking with other sources you may have, to confirm whether it is in fact personally true for you or meant as a general message for all. Give it a try, see how you like it. We'll do more along these lines before too long. For sometime now, beings on Earth - not humans, have been attempting to teach Earth humans the wisdom that they have been saving. This is not wisdom that they need for themselves but rather wisdom retained exclusively for us. There is only one way to receive it though - short of a benevolent contact - meaning perhaps in the form of a vision or an inspiration. The nice thing about this, that I'm going to share with you though, is that it might get some of you out into the woods in some benevolent place or perhaps simply outside to contact nature a bit more closely. For today I'm going to suggest a tree. It is not too complicated for most of you. This is what I recommend - go out somewhere outdoors. See if you can find a tree that is not overwhelmed by human contact - so ideally it might be in the forrest someplace or it might simply be in a place that's not very accessible by most human beings - perhaps on the side of a hill. You can grasp by my suggestion that it does not require that you touch the tree - as a matter of fact that may not even be desirable. As long as you can see it however - and while you can look at it through a telescope or binoculars or some other magnifying instrument it is important when you are attempting to contact the tree that you are looking at it just with your eyes and if you wear glasses or contact lenses you can have those on as well. So even though you might look at it through a magnifying instrument, if it is far away, when you are looking at it to make contact set aside the magnifying instrument. Now this is what to do - if you can get close to the tree get no closer then six feet from the lowest bough. If the boughs are not that low to the ground then get no closer then ten feet to the trunk of the tree. Then this is what I recommend, it might take a moment but it will be worth doing, first I want you to look at the tree and say, "Goodlife." If there are people nearby but not too close alright you can say in a whisper, "Goodlife" but make sure you say it with your eyes open directed towards the tree. After that imagine yourself being inside the trunk of the tree and imagine flowing up into the tree, into the boughs, into the needles or the leaves that the tree has. It is alright to do this no matter what the weather even if it is a dormant time for the tree it is alright. Then if you can, feel the sunlight - or perhaps it's at night then feel the moonlight on the boughs of the tree - the branches that is you understand - or on the leaves or needles. See if you can feel it - stay in your body because you'll need your feelings and see if you can feel a sense of contact. Some of you might get a message, some of you might see a picture, some of you might have a sense of physical feeling - we'll say more about that next time but for now make contact in this fashion. It would be best to do this with an older tree - one that has been on the planet, growing on the surface you understand, for a long time so that it may have some wealth of experience in interacting with human beings - perhaps even at a distance but there will also be interaction with other forms of life including spirit. Oh yes, trees are well aware of spirits - their own and others and it is within the core of their spiritual being that they retain these messages for us all. I'll say more about this next time. You've noticed haven't you, our love affair with cows. Of course cheese um-hmm - yes and milk and ice cream - all these wonderful things that we sometimes take for granted but you know - cows are more than that. In recent years they've become a popular symbol and over time have developed an image like an icon but have you ever looked at a cows eyes - they are feelings itself. Do you know, as I've been taught, cows directly reflect the feelings of Mother Earth and cows are here, aside from the great benefit they provide for us - yes, cows are here to show Mother Earth how much she is respected and loved and to show us how much we respect and love Mother Earth. There is a time now - happening right now that allows us to experience much more in the way of instant knowing. Instant knowing is only occasionally a thought, yes, a couple of words - an inspiration perhaps and under that inspiration that is poking up like a plant in the spring - under it is a vast reservoir of knowledge and wisdom. We are all learning now what our feelings mean, how they can be interpreted and how they can best benefit us. If you wish to have a lesson, next time you have an opportunity to look a cow - not a bull but a cow in the eyes it might be something worth doing. Glance at the cow and notice the expression, for they are very revealing in their feelings, in their eyes. Then relax for a moment and feel as much as you can - love and kindness in general. When you feel it open your eyes again and see if you can glance at either another cow or the same one and look at the expression in their eyes while you are feeling those feelings. You will get a nice feedback there. This is not a talk today designed to fire you up to save Mother Earth or to save cows though that is something I believe is at least in the back of our minds and perhaps at the forefront of our hearts. It is rather a gentle reminder how very often the creatures that are around us reflect so very much the true nature of Mother Earth's personality. As I have been saying for some time - now that Earth needs to look after herself now - to move her body, to move certain things of her own for herself, to check on her condition - so it is up to us with our good works applied benevolently through the use either of Benevolent Magic or Living Prayer or other prayers and other methods to look after the surface dwellers - the visitors if you like - on Mother Earth. I know we like to think that Creator does all of this for us but I believe and have been taught that Creator wants us to learn how to look after all beings for ourselves. That's why we're here - to learn Creator's ways in the most benevolent way, I believe. So my feeling is this - it would be good for us to get into the habit every day of doing some benevolent gesture or perhaps a Living Prayer - whatever is your style of service to support life here. Consider the animals - so many different species. Consider the plants also - so very many species. It might be something to consider saying a prayer or a Living Prayer always requesting that the most benevolent energies be available for you during that prayer and when you feel them to pause with whatever you are saying because the energies come in and support what you are saying and when they are there they do not speak but you feel it as energy you see - to let you know that they are there - that they are working to support what you are requesting. So while the unspoken energy is there, pause until it begins to fade a bit which means that it is taking the action - alright - that you have requested in the best and most benevolent way possible and then continue with the words and if you feel the energy present again - pause again. If when you say it you do not feel the energy at all then just say the Living Prayer or your own prayer slowly so as to allow the energies to resonate with it when they are able. I'd recommend that you pick a species of animal or plant and say a prayer for each one once a day - by this I do not mean over and over again. I mean pick say, a dandelion one day - just for example or say - a cat or a dog - any kind another day or pick say - horses or pick butterflies or pick cedar trees - something like that and every day say something for one species. Try to just make it one species per day. Of course if you wish to say something overall you could just say for example, "I am asking that all species of all beings on the Earth be insulated and protected from harm and that all those attempting to harm any species also be insulated and protected from harm." There's a reason we say it like this. The purpose is not to cast blame here for sometimes the reason that beings do harm is not purposeful, not intentional. It is just something that happens in the course of doing something else and other times there is no intent to attack specifically - it has to do with a drive or need of a being or a type of being. Casting blame only creates more problems. I find that it is much better to say, in my case, a Living Prayer that addresses a situation of all beings who are alive and allows all future living beings to be beneficially welcomed as well. This is my process, you may have another. Whatever you choose keep in mind that Mother Earth needs us I believe - to look after all life on Earth now. So lets do the best we can and if you happen to see a creature or have many reminders of certain plants around - pick those first to say your prayers and if you don't wish to see that creature or you don't wish to see that plant then you can say this Living Prayer as well, "I am asking that all those (then fill in the name for that creature or that plant or that type of person if you like) be insulated and protected from harm and that all those attempting to harm them also be insulated and protected and that each does not see each other nor hear of each other and that this lack of contact further insulate and protect and allow benevolence for all beings." That's what I recommend. Goodlife to you all and goodnight. I cannot really tell you how important it is to assume the impossible can be done. I do not mean to consider that it may be possible - that something heretofore considered impossible might be done but really to take in as a belief that the impossible can be done. This does not mean that terrible things can be done - it means that things that we have considered in the past or have been brought up to believe cannot be done, really can be done. It boils down to permission. What we have taken away from us when we start to grow up - and even when we are little children is permission - don't do this, don't do that, that's just your imagination. All of these things that are very well intended by the adults or parents or grandparents and even friends that we grow up with. Many of these intentions are well grounded so that we will be safe - at least in the eyes of those around us but how often is permission taken away, and of course we wish to please these people - yes, how often is permission taken away when simply by allowing that it may be possible - certain solutions could be derived. If not at a tender age then maybe someday when one grows up. I'm not here to blame anyone but rather I am mentioning these things because when I was younger I had some things that were also taken away but there were other things that were encouraged. I was fortunate enough to have parents that allowed me to imagine and such imaginings have led me to having perhaps, greater permission to assume the impossible can be done. I grant that when I started my work at the very beginning that I didn't believe that any of these things could be done. That was conditioning that I received as a result of my life up to that point but once I started having results and I had the evidence of my own eyes and other senses I came to it quickly - perhaps not as quickly as I would have liked but I came to it fairly quickly that the impossible can indeed can be done. I will be addressing the "impossible" more on this site - and while I have begun many of these topics on Benevolent Magic I will carry on with further lessons here and try to advance your capabilities as much as possible. For all those of you who are ready to embrace them - I salute you. For others who are not sure I welcome you to consider the possibilities. Let us consider now, the term "Earth changes" which many of us have been hearing for years and years. Having just experienced one of these changes in a most pronounced way I have come to a conclusion that may seem obvious to most of you. I have considered it in the past but my feeling is this - the real lesson of Earth changes is that our host, Mother Earth, must do things for herself. How often have we had friends over perhaps, and needed to do something for ourselves. Sometimes it was something simple albeit perhaps a little embarrassing and other times it was something more complex. How is it possible to do these things when people come over and yet we find a way don't we - and that's a simple if somewhat amusing situation but what about when you are host to millions of beings to say nothing of animals and plants and all kinds of beings eh and you have to do something for yourself. My feeling is that a lot of what Earth changes is about, is about acceptance and allowance. Mother Earth is a sterling example to us about allowance - what she allows us to do on her and even to her. I would like to say that I know many of us would prefer that we be good guests and not harm Mother Earth and yet how do we live, how do we survive. My feeling is that Mother Earth does understand that it is in our nature as it is with all life to survive as best they can. Maybe that's the key. Lets consider how we can survive as best we can on Earth while doing as little damage to Earth as possible. I know many of you have considered this but I'm adding my voice to yours in a gentle way to support that. Earth changes may simply be about bringing to our attention that Mother Earth is alive, she must do things for herself as we often do and that we can - as a good guest accept that with a minimum amount of complaint. I am hopeful that Earth changes now and in the future will be as gentle and benevolent as possible for all of us and for Earth herself. Now that you've tried or have found your place to pull yourself towards - lets do something else in that vein. I'd like you to pick a place on the land that is closer to you. Again, it is not to be something manmade, not to be a human being, not to be an animal but simply a place on the land. Always try to make it someplace where there is nothing manmade including - for example - an electrical wire in the air going from one place to another between you and the thing you've picked - to the best of your ability as far as you can see - just someplace in this case blank on the land but that you can see, that is not too far from you. It can be - oh say a hundred yards away or as close as 75 feet away but you don't have to measure it, just make your best guess. Then I'd like you to do the same exact homework as last time. Imagine a rope or a connection between you and that place and using your solar plexus - pull. The intention is not to pull the land towards you but because it is an immovable object to pull you towards that. There is a reason to do this and I will say more about it in time but that's your homework for now. I will say this last thing. I believe that there was a time in the past when there were people all over the Earth that knew how to do these things. Now there are just a few of us - I can feel that I'm not the only one. I want to pass these things on and since I have not many apprentices at the moment I'm nominating you if you want to participate. I'm not going to reveal anything dangerous here. I have from time to time had critics who have honestly, genuinely and from their hearts suggested that this is not a place to reveal such things and I agree that it can only be done here gently and with heart. So I will merely lay the foundations as I have been doing here. Know that the homework I've given in this last post here and this one today can only be used for benevolent things and I assure you, safety mechanisms have been put in place to make it possible to only use it for that which is benevolent. So, practice on the land and practice with good heart. There is reason, there is purpose, there's love and there is yes - co-ordination involved here. Co-ordination of a different type that is designed to enable you to interact benevolently with the Earth in ways that she uses, as I've been taught - in balancing and ordering and in interacting with all parts of herself. There was a time in the beginning of my career when I had doubts. No matter what I was able to do I would - even after having been trained and having accomplished it well - I would have doubts. I would question what had happened. Now as time has gone on and I've been trained to do many, many more things and have the evidence afterwards of having been involved in these creations I no longer have much in the way of doubts. In fact I feel comfortable when observing the physical results - such as inviting the rain or even deflecting from this place or that place in the world some event of proportion. Excuse me for being vague but I have been taught to do some things involved with the natural processes of Mother Earth and have been taught how to know, with physical evidence, when it's alright to request that this happen and when it's alright to participate in the motion of something one way or another - by this I mean I have on occasion been able to reduce through influence with Mother Earth the power of an earthquake or move very gently a storm - so that it would miss land. Along these lines it is easy afterwards to say - did I really do that - and I have found that over time I'm more aware of having participated in it. Now I'd like to bring it to your attention, more of the steps in accomplishing these things and to also let you know that you also will have doubts because we have been trained to believe that we cannot do things - that the impossible is all around us and that we are just trying to get by as best as possible. In my experience we can do a great deal - even an individual. I am an individual and I have been taught how to do many things. I have encouraged you over time to try this, to try that. Many times these are all steps towards benevolently influencing - now I will suggest that you try something else. Be alert to the fact that I'm not suggesting this so that you would actually accomplish what it is I'm suggesting - this is simply another step in your training if you wish to participate. I'm going to recommend that you put your gaze on an immovable object. It must be something that is - in its own right - solid and a portion of Mother Earth. So this means that it cannot be something manmade - not a building for instance. It can be a very large old tree which does not necessarily have to be alive but it must be well and firmly rooted to the ground. It can, and this would be better, be a mountain or a mesa or even a hill. If so then it would be best that you are either at the base of it or even at some distance from it but can see it. It is not to be the moon or the sun or a star in the sky - it must be something on the land. This is what I'd like you to try. I'd like you to look at it and then with the solar plexus, if you know where that is - I think you do, I want you to pull. Don't pull the object towards you - rather imagine a cord or a rope if you like between you and that object and pull with the idea that since it is an immovable object you see - pull in such a way as you can feel yourself being drawn towards it. You have to do this from your solar plexus, not from your belly button but from your solar plexus. Thats all. Just do it once. If you feel like it and if you feel comfortable you can do it twice. Now this isn't to attract yourself to anything but it's a step towards homework and I'm going to suggest that you try it now. I will say more about this next time. Greetings. I want to let you know I'm alright and I also want to thank you all for your prayers and your concern. Please everyone say Living Prayer or your own kind of prayer for everyone here in Hawaii and everyplace else that you feel may need it. If you don't remember what to say I recommend you say, "I am asking that all those beings who need help receive all the help they need now in the most benevolent way from all those beings who can help them." I have spoken before about the amazing things ants will do to not only communicate but to also deliver messages. I have been blessed in that I have received messages from many different creatures - ravens, ants and others but now I would like to say just a brief reminder about ants. Ants have made it their devotional work to remain on the Earth however unwelcome they seem to be to us at times to deliver messages. They have the capability to move in patterns not only to express their own needs but to deliver most important messages. You will all notice - perhaps you have seen it already - the various videos available here and there on the internet now showing ants moving in a pattern that resembles a vortex. Do not be alarmed when you see this. It is actually a wonderful sign referring to a total link of complete unity which has taken place for all beings. It is essential you see, for all beings on Earth and beyond to have a moment when a total link takes place. This allows us all to move forward into a more benevolent world. It has taken place and these wonderful messengers have given us the message. I will say more about this as time goes on. So I just wanted to mention it to you now because when these moments take place which they must - we can all expand benevolently and with no effort - changing nothing outwardly but allowing our spirits, hearts and souls to become more of our native personalities on a daily basis. I recall a time once when I looked outside just through a window and I saw a great many people walking along but there was something odd about it and I realized they were above ground and yet they were walking. It was like - rows of people - maybe 2 or 3 rows and there was something further that was odd about it and that is that their garments were very colorful - different colors but not unlike the garments we have today. This was during the time when I was living in a mountainous region in Colorado. After watching this for several minutes it came to me what it was about and it explained the unusual energy in that area where I was living. The trail of people seemed to just begin at one point in the air - not way up in the sky you understand for I was looking slightly down into a valley - and then it just disappeared. I realize though what it was about. This was a pathway that souls were taking from one point to another after death. They clearly didn't see me, so I was seeing something that was beyond their perception but was in that moment available to my perception. I have since been taught and can attest to as a result of this experience that there are circumstances in which people will come together after death and not immediately proceed on with their lives. Of course there are individual circumstances like this but I'm talking about something that's more of a group or collective experience. This situation is not some cursed kind of a reality but rather allows these beings to feel a sense of connection with other beings when they feel, as a result of their lives or experience, disenfranchised. I've been taught that it's a way that souls get in touch with their hearts after death. Many of the teachings I've been exposed to lead me to believe that many of these people have had a hard time in life and have tried one way or another to escape life while living it. I've also been taught that this experience that I was a witness to briefly was something that they experience for a very short time - just enough for them to get used to the idea that they are not alone and that others like them have had a similar sense of disenfranchisement. I'm mentioning this to you today not because I expect it to be of any great startling revelation to you but rather because it's important to know, even if you feel totally disenfranchised and even if - I hope not but even if your life ends with that feeling, you will be guaranteed an opportunity to feel a connection with others and I believe you will move on with a sense of union with all peoples. The faces on these peoples - maybe I didn't say - they were all types and a distinct feeling was that they were from all times but they were meeting in that moment to feel a sense of life being worth living.